KGS photo. Ian Skea left back row . Alan Findlay signature on back of photo. Are the two on the front row wearing badges the school captains and the other three prefects . Any names ? Archie Findlay front left, David Walls front right. I recognise the others, but cannot recall names. 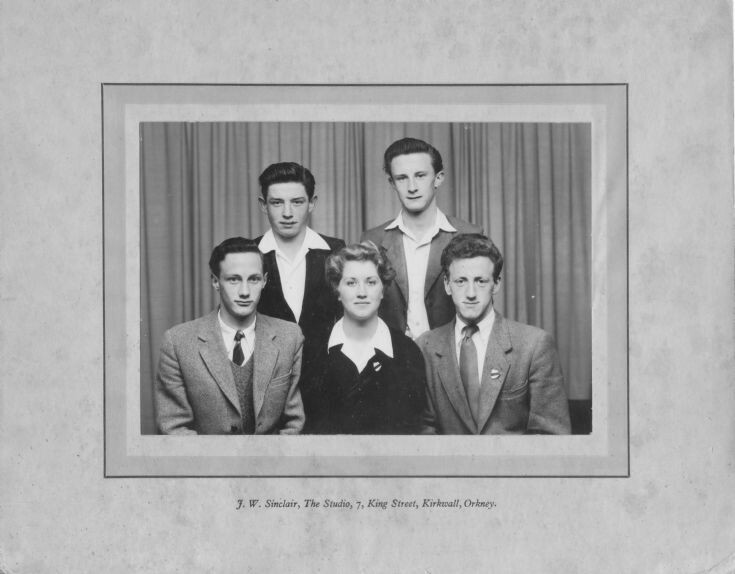 DAVID SCOTT N.R.ARCHIE FINDLAY EMMA PEACE DAVID WALLS? Back Row L-R : Ian Skea ; David Scott. Front row L-R : Archie Findlay ; Emma Peace ; David Walls. I think this was a Committee which was charged with the responsibility of producing the KGS Annual Magazine? The year would be 1954 or '56? I don't think it was 1956 as I remember Archie at college in Aberdeen in 1956. Sorry. Can't argue with that. My memory must be worse than I thought!